To all but the most grizzled veterans, corporate sustainability and responsibility continues to evolve into an increasingly complex, hard-to-grasp realm of processes, organizations, stakeholders, reporting, standards, certifications, laws, regulations and more. While it's often not necessary to understand all of the variations each of these play for a specific company's efforts, it is helpful to understand the big picture in making the best decisions related to CSR efforts. That's why I thought I'd take a crack at the first CSR mind map that I'm aware of that encompasses the major concepts for U.S.-based CSR executives. It's designed to fit on a single, typical computer screen or standard 8.5 x 11 inch page while remaining legible, thereby providing the big CSR picture at a glance. Think of it as a "back-pocket" road map that helps you piece together the CSR puzzle and make connections between various steps and aspects of the process. The red arrow illustrates one those connections explicitly (e.g., from CSR reporting under "Organizational Processes" to the "Major Reporting Standards"). Click on the detail image below to see the full-sized CSR mind map. • while CSR-related laws and regulations provide the minimum base from which best-in-class CSR programs expand, major certifications are important for helping organizations go beyond minimum compliance, and in gaining credibility and market awareness. 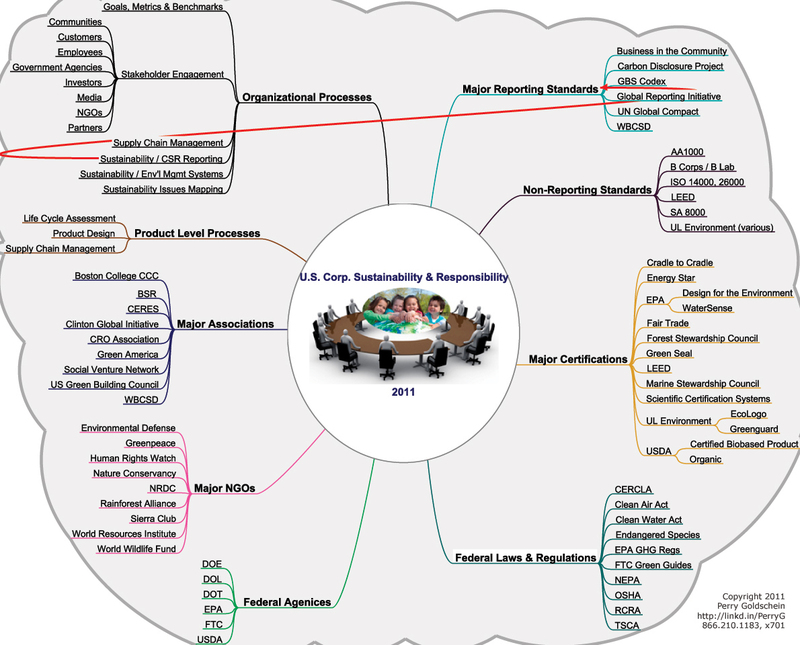 I hope this mind map proves helpful in planning, review and communication of your CSR efforts. Since this is only a first draft, please do let me know if it's helpful and how you think I can improve future versions. Please comment on this post or email [email protected]. I would specifically be interested in feedback on whether it would be useful to have more information on additional pages, with separate mind maps, for concepts such as certifications, for example, where literally hundreds exist in dozens of categories; and any thoughts on how existing information can be more accurately classified. Thanks to Susan McPherson of Fenton Communications and Ellen Weinreb of Sustainability Recruiting for their valuable input. Map photo CC-licensed by Changhua Coast Conservation Action.